"Share your favorite teatime recipe for sweets or savories. Tea sandwiches, scones, and dainty desserts all count in this category. Give credit to the originator of the recipe if possible. 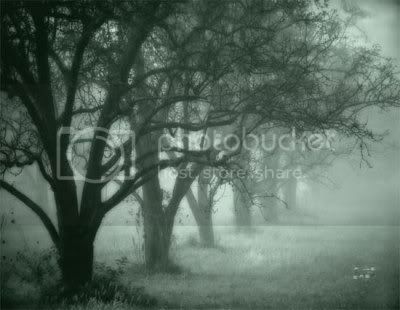 Post a picture if you can. This is sure to make everyone hungry for a delicious tea time treat!" GJ is a plain scone guy. He wants no fruit, nuts or flavorings added. He likes English non-sweet scones, not the American flavored cake-like version and he does not want sugar or icing on top. 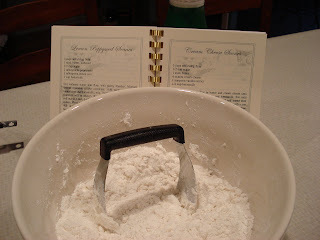 This recipe is one I adapted from Diana Bloomer's recipe at Lady Marpelet's Tea Room in Cookeville, TN after GJ declared her scone to be the best American scone he had eaten. Mix flour and sugar. 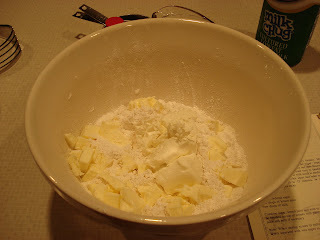 Cut in butter and cream cheese until coarse and crumbly. Add vanilla and buttermilk. Stir until well blended. Turn out on a floured surface, knead until easy to handle. Roll or pat to 1 inch thick circle. 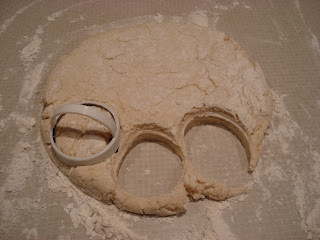 Cut with a 1 1/2 inch biscuit cutter or to desired shape. Place on a greased cookie sheet. (Instead, I use parchment paper on a cookie sheet.) 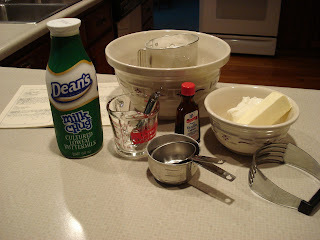 Brush tops with heavy cream or milk. Bake at 400 degrees 15 minutes until lightly brown on edges. Serve with Clotted Cream (mock clotted cream in the USA), Strawberry Jam or Lemon Curd and enjoy! Note: We enjoyed scones from a very similar recipe (same ingredients, different amounts) by Brenda Rowell, of the former A Time Remembered Tearoom in Thomaston, GA. Both Diana and Brenda use more sugar in their scone recipe and brush with a thin icing made from 1 cup powdered sugar, 1/2 tsp. vanilla extract and water, adding 1 tsp. at a time until it reaches a spreading consistency. Brush or drizzle with 1/2 tsp. the icing while the scones are warm. Wish I was there to eat them with you! 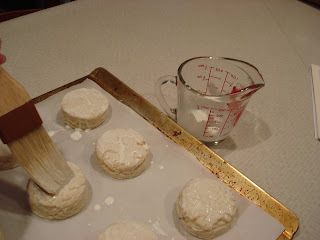 Cream cheese scones? Oh my goodness! Your scone recipe looks delicious. It reminds me of scones I had while in Scotland. Millie, thank you for your comment. That is exactly what I hoped to accomplish with this scone recipe. Oh these scones sound delicious! I love the idea of the cream cheese as an ingredient *in* the recipe! Thank you, too, for sharing with us photographs of your steps as you created these sweets! Beautiful photo and thanks for the how to photos in making these scones. I'm so pleased to get all these great and varied recipes this week. Ooo! Now these sound yummy! Of course, ANYTHING with cream cheese in it has got to be delicious. 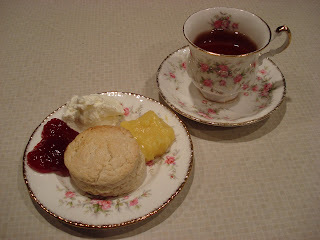 I agree, plain scones are my personal favorite ~ with mocke Devonshire cream and strawberry preserves. Thank you for sharing this wonderful recipe. I look forward to trying it. I love the idea of cream cheese scones. They look so light and fluffy. Thank you for sharing. That scone recipe sounds excellent. My husband, Scottish Terrier Baxter, and I are moving from Indiana, to Oklahoma, in two weeks. As soon as I am settled, I will be making the recipe you have posted here. I love to try new scone recipes, and this sounds like just the kind my husband would like. No nuts, fruit, etc. Thanks. Oh my gosh! Cream Cheese Scones! How good do those sound. Cream cheese is my favorite food group! MMmmm they look delicoius Linda, I miss scones with jam and clotted cream! Sounds good, I want to try them sometime!